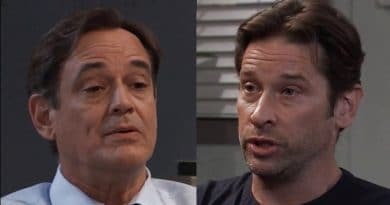 General Hospital spoilers hint the truth catches up with Valentin Cassadine (James Patrick Stuart), likely because either Sasha Gilmore (Sofia Mattsson) or Liesl Obrecht (Kathleen Gati) spills the beans. It looks like Nina Reeves (Michelle Stafford) finally learns what Valentin did. Is there any way for Valentin to save himself once she finds out about this ultimate betrayal? It looks like things aren’t looking up for Valentin anytime soon, as his secrets finally get revealed on GH. He’s been walking a thin line trying to keep more than one person from telling all that he has done to Nina. Now, it seems that someone finally does. All Valentin Cassadine wanted was to win back his wife. And now he has. Nina accepted his proposal. This is all down to him finding her “daughter”, who she believes is Sasha. Of course, viewers know that’s a big lie Valentin crafted to win back her affection. As she discovers the truth, it doesn’t seem likely she would ever trust Valentin Cassadine again. Now, Liesl Obrecht knows the truth too and is a loose cannon. 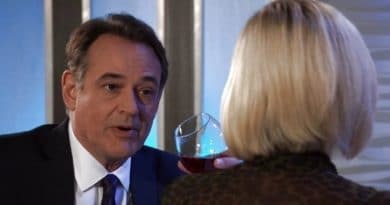 He’s on borrowed time hint General Hospital spoilers. 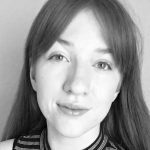 One reason the truth could come out in the near future has to do with Sasha Gilmore, the woman acting as Nina’s long lost daughter on General Hospital. Since Valentin couldn’t find her real daughter, he hired one to play act. And it seems to be going well. Until now. Valentin Cassadine was in the clear after he got Sasha to leave town. Finally, he could relax with Nina without the threat of Sasha Gilmore potentially ruining everything for him. However, as Sasha just came back to town, she could still wreck Valentin and Nina’s relationship. When Sasha returned, Valentin wasn’t exactly happy. Things became even worse when Sasha said that she holds all the cards now. While she might prefer to stay quiet and leverage Valentin, she could still accidentally slip and blab the truth. Plus Liesl Obrecht seems to be back to stay on GH, and she’s trouble. M: You want a job at Crimson? L: I did, but I'd rather drop dead than work for my niece. N: Would you like to drop dead? Would you? Go for it. Sasha might not spill, but that doesn’t mean that Obrecht won’t on GH. Possibly more than anyone, Liesl Obrecht is the one person who could bring him down. After all, she already doesn’t like Valentin Cassadine lying to her niece. Dr O isn’t overly fond of Nina, but doesn’t want her lied to and hurt like this. While Sasha has proven that she doesn’t have a hard time lying to Nina, Obrecht is a little different. She already hinted to Nina that things aren’t right with Sasha. Therefore, she could very well be the one to finally confess everything and spoil Valentin’s scheme. Once the truth about Sasha Gilmore comes out, Valentin Cassadine may lose Nina for good. The question is whether it will be Sasha Gilmore or Liesl Obrecht that spills the beans and wrecks Valentin Cassadine’s life. You can see what happens weekdays on GH. Also, make sure you head on back to Soap Dirt daily for all the new General Hospital spoilers and updates. ← ‘Bold and the Beautiful’ Spoilers: Hope Sick of Being Coddled After Baby Loss? 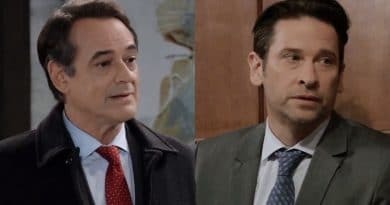 ‘General Hospital’ Spoilers: Ryan Makes Franco His Pawn – Frames Him for Murders?